Students, faculty, and staff at the University of Maine’s Orono campus experienced an October surprise this year – two unrelated power outages in a single week. The first one darkened the campus and adjacent downtown on October 27th. Three days later, a storm with near-hurricane force winds roared into New England taking power down again on October 30th for several days. The disruption closed dorms, cancelled classes and disrupted computer networks. This is the new norm for the northeast region of the United States. The question at hand is how do we create more resilient energy systems for extreme weather events caused by climate change and how do we address the root cause which is greenhouse gas emissions? Fortunately, the implementation of district energy systems allows both goals to be accomplished in a more strategic and efficient way. Distributed energy resources, particularly Combined Heat and Power (CHP) systems, are advancing both initiatives simultaneously. Climate change is fundamentally our greatest challenge to overcome. We know the trapping of greenhouse gas is making the planet warmer and that human activity is mostly responsible through the combustion of fossil fuels. This is a trend we must reverse. Climate change is causing severe weather events that our existing infrastructure was never designed to withstand. We are reacting by creating more resilient systems and reducing our greenhouse gas footprints with the expectation of halting, or even reversing, climate change. As a result of climate change, many states in the northeast have implemented legislation that facilitates the development of renewables and distributed energy systems. Many institutions are banking on a future of emission-free power sourced from the larger grid. The available technology consists of wind-based and photovoltaic-based power generation systems. At face value, this may seem like a simple and achievable approach, but there are complications. From a grid perspective, the combination of intermittent production with variable demand is a recipe for higher costs and lower reliability. Energy storage is touted as the technology of choice to smooth out the differences in demand and production of renewables. However, technologies such as battery storage introduce significant losses and high capital expense requirements. Additionally, energy storage is primarily a short-term fix for matching demand to production. For the northeast region, there is a tremendous hurdle to overcome with renewable production as outages due to blizzards and nor’easter storms reduce renewable outputs. This creates a significant challenge solvable only through improvements in existing technology. In short, it is a gamble to depend upon a future of grid-based, emission-free power in the Northeast. The implementation of district energy provides the platform for a portfolio approach, which allows any site to customize an energy strategy that combines the right systems and technologies to match specific needs. 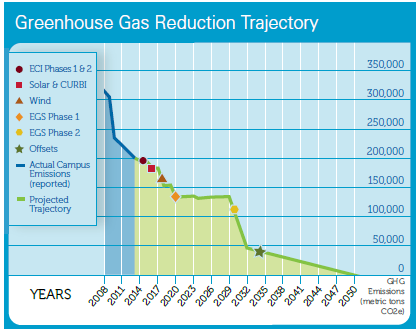 District energy is a platform-based solution that allows for a lower greenhouse gas footprint, higher resiliency, lower cost and future option flexibility. 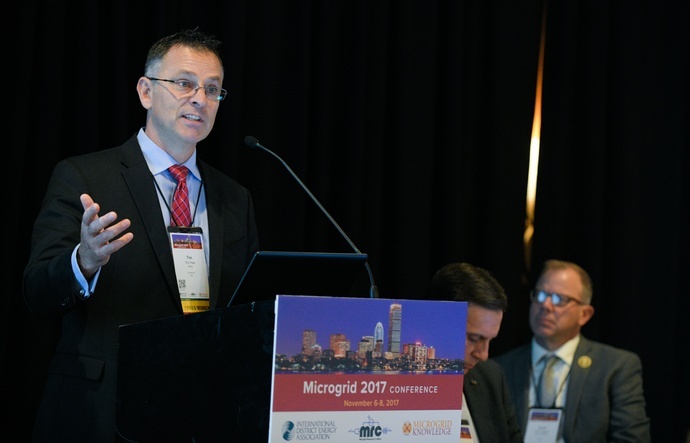 As a platform-based solution, the thermal host is the asset that makes microgrid decarbonization possible. Institutions that have district heating, cooling and their own power distribution systems have the ability to leverage the full suite of available and future technologies to meet climate action goals. 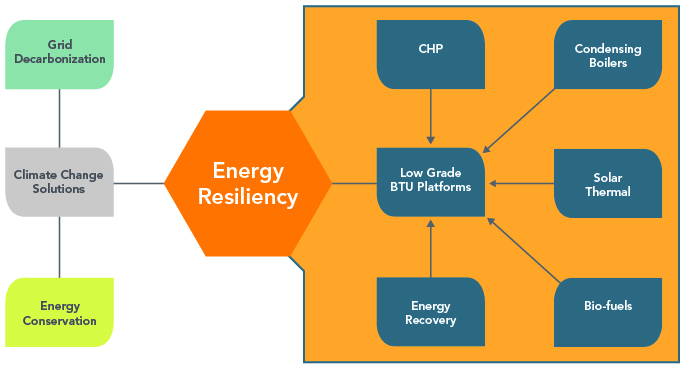 When coupled with a low temperature hot water thermal platform, the ability to integrate energy recovery, renewables and high efficiency technologies such as CHP is optimized. The path to successfully implementing a climate action plan that includes a carbon neutrality goal is not a simple undertaking. The commitment, while bold and progressive, has implementation challenges that require decisions today that may be impacted by an unknown future. Current decisions and issues to address today include whether to electrify campus systems and depend on grid decarbonization as a path to carbon neutrality. This decision needs to carefully consider the value of resiliency and the possibility that the long-term goal may not materialize. When addressing climate change, its severe weather events, and the need to reduce our greenhouse gas footprint, one thing is clear about the future: the value of a district energy-based solutions platform will increase in value. District energy is a strategy that will reduce carbon emissions, reduce regional methane usage and provide the platform for future biologically derived fuels, all while enhancing business continuation. CHP is a near-term strategy that enhances resiliency with future optionality; no other current choices have this portfolio benefit. As BOND’s Vice President of District Energy, Tim Peer, P.E. leads a team of professionals with a focus on innovative client solutions for onsite thermal and power systems. This includes renewal and upgrades to existing systems as well as new or replacement systems which are efficient, resilient and cost-effective. With over 25 years of experience in campus district heating, cooling and microgrids, Tim is an expert in working with institutional clients. He is a board member of the International District Energy Association (IDEA) and serves on the policy committee for the Northeast Clean Heat & Power Initiative (NECHPI).